Calculate, comment, correct - the adding machine for your Mac ! schoettler CalcTapeis a revolutionary new kind of pocket calculator. With CalcTape, also extensive calculations remain clearly structured. CalcTape makes the arithmetic process visible - you can generate interim results and subsequently correct or change all numbers and operations. Scratchpad for every-day calculations is being saved automatically. Put calculations side by side for comparison. Work with variables and generate "speaking" calculations. Define as many programmable keys as you like. Use parentheses and trigonometry when defining variables. iCloud support (macOS 10.10 and higher). Sync your calculations with iPhone and iPad easily. 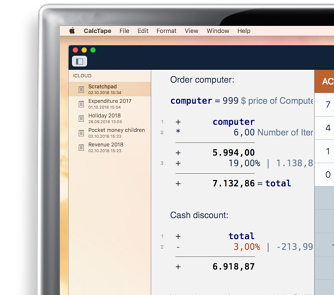 CalcTape for macOS requires macOS 10.9 or higher.